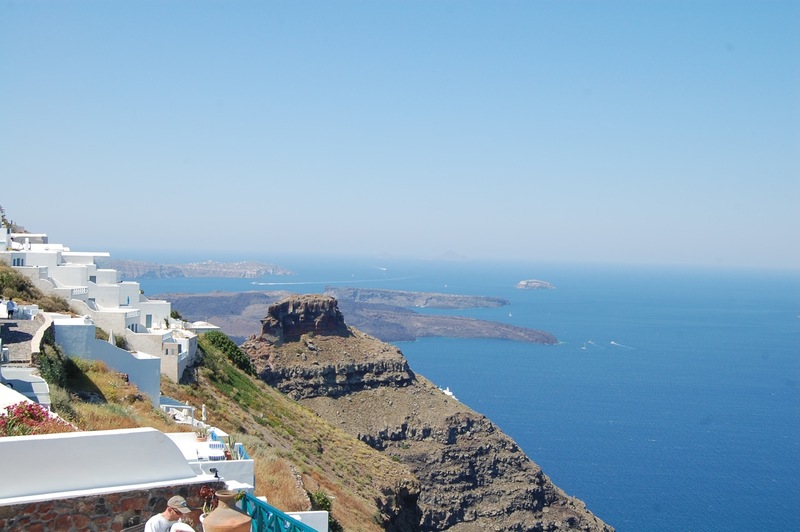 As the Greek crisis unfolds I just received this incredible picture from Jaynes comrade Jeremy Parzen taken from the Sigalas Winery in Santorini. Jeremy has spent the past year as an ambassador for Greek wines heading up the Boutari Social Media Project and I urge you to head over to his blog and read about his Aegean adventure at Do Bianchi happening right now. We've been digging into a lot of the lesser publicized yet great wine regions this year. The Greek wines in particular have filled our punch card full of high marks. We are now pouring the 2010 Domaine Sigalas Asirtiko-Athiri by the glass. This is a mineral driven wine with racy acidity and generous fruit. An excellent hot weather seafood wine,no doubt, that I would liken to a Loire Valley Muscadet with just a touch of salinity from the nearby sea. This predominant grape is Asirtiko or Assyrtiko that is native to the island of Santorini where wine has been made for over 3500 years. The vines grow in a soil of Volcanic ash in a unique basket shaped pattern to protect themselves from the sea winds and high temperatures. Talk about terroir! Get back safe Jeremy and thanks for your positive coverage of Greece. They sure could use it right about now.